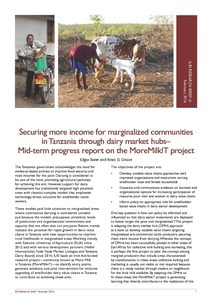 For the past several years, the International Livestock Research Institute has worked closely with Sokoine University of Agriculture, Heifer International, Faida Faida Market Linkages, the Tanzania Dairy Board and other partners in a project to identify entry points, generate evidence and pilot interventions for inclusive upgrading of smallholder dairy value chains in Tanzania. Informing policy on smallholder value chains in dairy sector development. Alongside the update, a short note gives an update on dairy income results from baseline and monitoring surveys in the project.